Five innovative projects are to receive £350,000 each from government to adapt their schemes for the rail network, having been chosen for development funding in the second round of the Department for Transport’s (DfT’s) First of a Kind (FOAK) competition, which focuses on innovative schemes that can cut the carbon footprint of the UK’s railways. 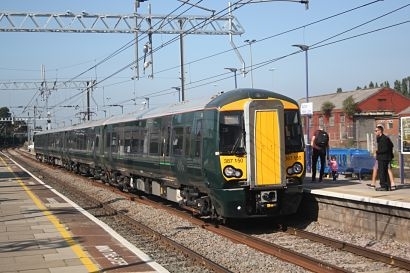 The announcement comes as rail industry leaders publish the interim Rail Industry Decarbonisation Taskforce report addressing the challenge set by the DfT last year for cutting emissions and removing diesel-only trains from the network by 2040. “We want a cleaner, greener rail network and transforming our trains will help make this a reality” said Rail Minister Andrew Jones. “The targets we set for 2040 are ambitious but are within our reach. It is encouraging to see the huge efforts already underway to make this happen. This funding will be vital in helping these fantastic projects adapt to the demands of rail and enable their potential roll-out, delivering a cleaner, healthier network for passengers. It also underlines the shared commitment of government and industry to ensuring we have a modern railway that protects our environment”. Simon Edmonds, Manufacturing, Materials and Mobility Director, Innovate UK added that travelling or moving goods by train is rightly seen as more sustainable, yet there is more that can be done to make the railway cleaner and greener by decarbonisation. This can be achieved by deploying more energy-efficient systems, using lighter rolling stock and looking at technologies from other industries. The pioneering projects awarded funding can reduce both the costs and the carbon footprint of the railway industry and help innovative companies succeed, both in the UK and in export markets. Among the priority lines for potential battery hybrid trains will be the Lakes Line in Cumbria. Train operator Northern will shortly submit a business plan for it to potentially be one of the first lines to benefit from this innovative technology. Manufacturer Alstom, engineering company Viva Rail, and rolling stock owners Angel Trains and Porterbrook are also developing a range of alternatively-fuelled trains for the UK network, including battery hybrids and hydrogen powered units. One of the projects awarded funding is the 10:10 Climate Action project ‘Riding Sunbeams’, which aims to power trains with solar PV panels. This project would utilise specially designed power electronics to connect PV directly to electrified railways in order to power the trains. There would be no need to connect to the grid. This kind of project has not yet been accomplished anywhere else in the world, but 10:10 Climate Action believes that small solar farms installed alongside the railway tracks could provide around one tenth of the energy needed to power trains on these routes each year.